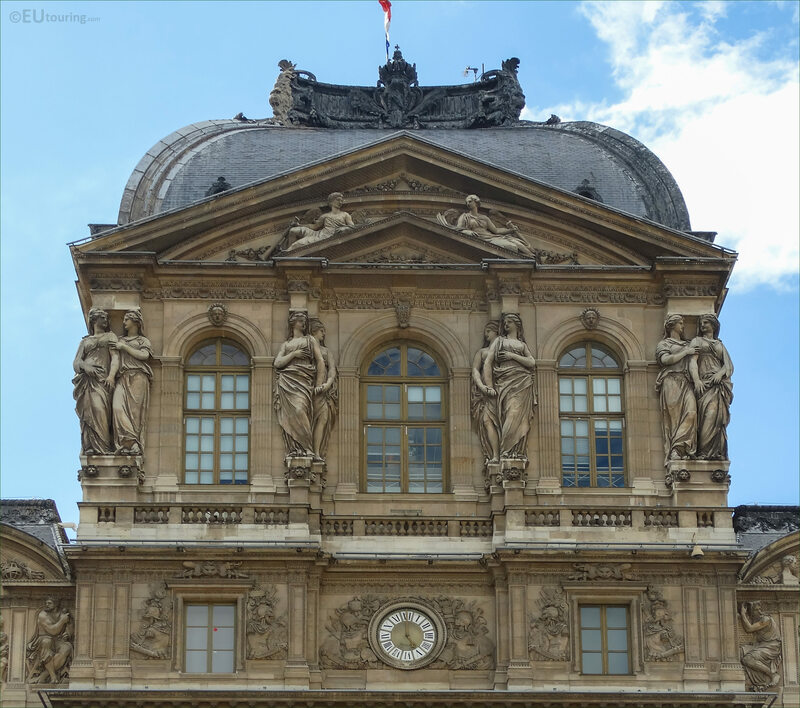 This time while we were at the Musee du Louvre in the 1st Arrondissement of Paris, we took these high definition photos showing a set of Caryatids, which were sculpted by Gilles Guerin. 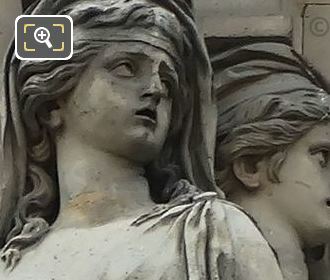 Located on the Pavillon de l'Horloge of the former Palais du Louvre, in this first HD photo you can see a set of Caryatids, which is an architectural term for a female figure used as a support on a building, that derives from the Greek term Karyatides meaning maidens of Karyai, and always having an entablature on their heads, like you can see here, they have been used for centuries as far back as the 6th century BC. 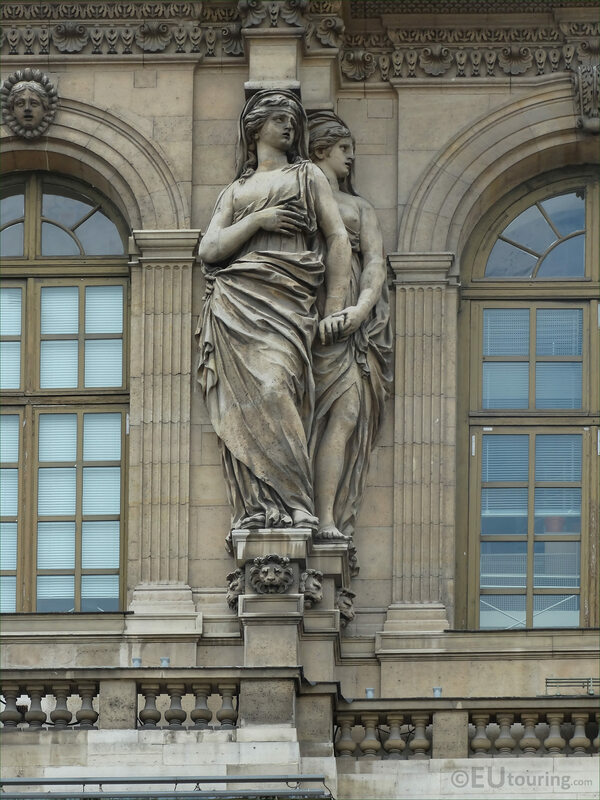 It was actually Jacques Sarrazin who designed these caryatids along with other decorations for the Pavillon de l'Horloge and he commissioned the French sculptor Gilles Guerin to sculpt these back in 1638. In fact, Gilles Guerin, who was born in Paris in 1611, produced works found at many famous tourist attractions including The Louvre, and the Chateaux of Versailles, Chantilly and Fontainebleau. Now this photograph shows the entire top section of the Pavillon de l'Horloge, which is often referred to as the Pavillon Lemercier, as it was Jacques Lemercier who was the architect that constructed this particular section of the former royal palace, and you will see that this set of caryatids by Gilles Guerin is positioned second from the left hand side beneath the pediment. 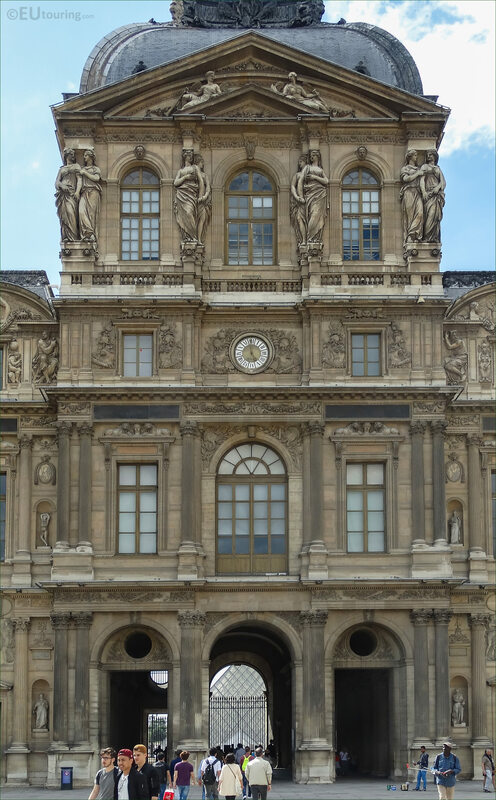 So in order to see the entire Clock Pavilion of the Louvre Museum, you would need to be in the courtyard called the Cour Carree facing towards the western side as though looking towards the Cour Napoleon that you can just see a part of through the arched passageway.